Keit-Ai always finds a way. "A boy falls in love with a girl. Unable to confess, he is gifted by a deus ex machina with the girl's phone number. Never minding the strange area code, he immediately calls her, and is overjoyed to find out that she has a crush on him as well." — The opening lines of the Keit-Ai copypasta. Keit-Ai (Keit愛, translated as "Cel-Love") is a meme copypasta from 4chan about a romance anime that doesn't exist but users there pretend it does anyway. It was first posted in a "Write an Anime and Manga Plot" thread on the site's /a/ (Anime and Manga) board. It was originally based on Toradora! (specifically its Matchmaker Crush plot), only this time it has twice the Ryuuji and Taiga ◊. Throughout the course of its existence, Keit-Ai has been turned into a meme , an exploitable snowclone copypasta, a Vocaloid fanfic , two original fiction stories, a webcomic , an anime "opening" , an anime "preview" , a full anime "episode" , and a hit anime "movie" that's already the highest grossing anime film of all time . "So this is meme magic. Not bad." But, the next day, when he recounts the previous day's confessions to the girl, she only looks at him with a perplexed expression. After some investigation, he finds out that the girl he called is not the same girl he fell in love with. In fact, she doesn't exist in this universe at all. She is the girl's alternate universe counterpart, who has fallen in love with the MCs own AU self, who too is blissfully unaware of her crush. Even though the plot was written for a thread on an English-language image board and its derivatives were also made by English speakers, Keit-Ai is still set in Japan and features Japanese "anime" characters (just like Katawa Shoujo). Subverted with the short story version of Keit-Ai, which instead features English names (John and Jane), a (presumably) western setting, and a conversation referencing mostly American pop culture (including talk of Disney, Barack Obama, Donald Trump, the 2016 U.S. Presidential Election, and... ironically enough... Jeff Goldblum) without a hint of anything Japanese even though it still retains the Japanesey Keit-Ai title. Alternate Self: The copypasta's plot revolves around the boy and the girl revealing their deepest, darkest secrets to equip each other with the weapons needed to conquer the hearts of their other selves from their respective universes. Alternate History: In the original fiction version of Keit-Ai, it's not only the area code of Seiko Okamoto's phone number that's different in Tomoyuki Yamamoto's universe (or timeline). In his reality, Michael Jackson was "always black" (that is, he never bleached his skin white and engaged in cosmetic surgery), Kurt Cobain didn't commit suicide in 1994, and the Lost Decade of Japan never happened. Alternate Universe: The copypasta refers to a boy talking to the alternate universe counterpart of his crush. Boy Meets Girl: A boy falls in love with a girl. Close-Enough Timeline: In the original fiction version of Keit-Ai, this is Tomoyuki's universe compared to Seiko's universe (the latter of which is based on our universe). Cannot Spit It Out: The boy is unable to confess to the girl (initially). The Casanova: In the webcomic version of Keit-Ai, this is Shinji Sawamura (Kei Kirishima's best friend who has a reputation of being a skirt chaser). In the end, he was actually being The Matchmaker to Kei all along. Chick Magnet: In the original fiction version of Keit-Ai, this is Kazuhito Sugata (he has his own unintentional harem). Color Wash: In the webcomic version of Keit-Ai, the universes are differentiated by the color wash on the drawings. Universe A (Kei Kirishima's universe) is tinted blue. Universe B (Ai Ayazaki's universe) is tinted brown. An unspecified Deus ex Machina is responsible for allowing the boy and AU version of his crush to contact each other through their cellphones. In the Vocaloid fanfic version of Keit-Ai (named "Cellphones" ), the living embodiment of the Deus ex Machina in the form of a mysterious old woman ultimately gives Miku Hatsune the means to call the AU version of Luka Megurine. Epunymous Title: In the webcomic version of Keit-Ai, the two cross-dimensional lovers of "Kei(t)" and "Ai" are named after the already pun-filled series name. The copypasta is an homage to your typical Makoto Shinkai movie, right down to being a love story dealing with distance. This is ironic in light of how Shinkai's latest film, Your Name, has been linked or outright claimed to be the anime movie version of Keit-Ai as soon as it was announced. However, according to the very first archived version ◊ of the copypasta, Keit-Ai or Cel-Love was initially inspired by Tora Dora and its Matchmaker Crush plot. In Spite of a Nail: The parallel universes of the boy and the girl are practically the same with little differences between them. If it were a Mirror Universe situation and it involved the complete opposite versions of themselves, it would've become a completely different story. The boy and the AU version of his crush (or in the AU crush's point of view, the girl and the AU version of her crush) suffers from this when they realize they've fallen more in love with one another than with their supposed crushes. Makoto Shinkai loves this trope, hence the comparisons between Keit-Ai and his work. The mock "OP" or opening theme to Keit-Ai found in the fake anime episode is entitled "Love Distance Long Romance" by DECO*27. The song's lyrics describes the trials and tribulations of a long-distance romance. It's also referenced in the Musical Sting that plays at the end of the fake anime preview . Masculine Girl, Feminine Boy: In the original fiction version of Keit-Ai, this is the kind of relationship that the wimpy loser Tomoyuki "Cherry Boy" Yamamoto and the sporty (AU) Seiko "Amazon Queen" Okamoto has (with a mix of Tiny Guy, Huge Girl). The Matchmaker: The boy and the girl from another universe work together as each other's matchmakers so that they'd end up with the AU versions of each other. Matchmaker Crush: Originally, the boy offered to help set up the girl with his AU self, with the understanding that she would help set him up with her other self. Due to the amount of time they spend together however, hijinks ensue and they end up falling in love with each other instead. 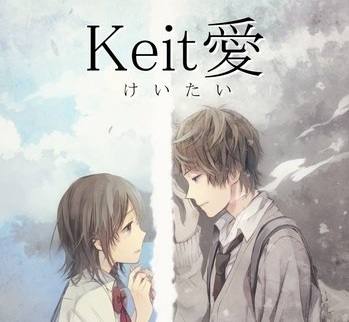 Meaningful Name: In the webcomic version of Keit-Ai, the protagonist's name "Kei(t)" and his love interest's name "Ai" reference the title of the work. Pun-Based Title: "Keit-Ai" is a portmanteau of the Romanized Japanese words "Keitai" ("Mobile" as in "Mobile Phone") and "Ai" ("Love"). In the copypasta, both the boy and the AU girl were serving as each other's wingmen (or wingpersons). In the original fiction version of Keit-Ai, Tomoyuki attempts this on his crush's crush, Kazuhito, so that he'd end up with some girl other than Seiko. In the webcomic version of Keit-Ai, Sawamura instead serves as matchmaker between the Kirishima and Ayazaki of Universe A. However, it was all for nothing because by this time Universe A Kirishima had already realized he's in love with Universe B Ayazaki instead. Super Cell Reception: The cellphone of the boy can somehow call and text a number from another dimension (and vice-versa with the girl and her own cellphone). Supernatural Phone: The cellphones of the two lovers can be considered supernatural because of their ability to connect to different dimensions. Tagline: "Keit-Ai finds a way ◊" or "Keit-Ai always finds a way", which itself is derived from the famous Catch-Phrase of Jurassic Park's own Ian Malcolm, "Life (uh) finds a way." One way to troll people is to post the Keit-Ai copypasta and then ask them if they're familiar with the "anime". Or you could lie and say you've written the plot yourself . Or you could post it as part of your fake anime recommendations list . Or you could link them to the preview or episode of this supposed "anime". Or you could claim that Your Name is actually Keit-Ai by using an edited promo poster .